Study field "Management, administration and real estate management"
The programme will provide applied skills and concepts related to the leisure and tourism or external relations services management. The degree will focus on the development of management and entrepreneurial skills needed for people wishing to assume greater responsibilities within an organization, or for those wishing to start new enterprises. The management of tourism services is a challenging career in increasingly leisure-oriented society. Dynamic, creative and innovative people are needed to plan, organize and supervise tourism activities in a variety of settings and positions. Programme specialization management of external relations prepare students for work in field of external communications in the public or private sector. Part C – selective courses. To complete the study programme a student has to acquire 160 CP (240 ECTS). State examination and Diploma paper. 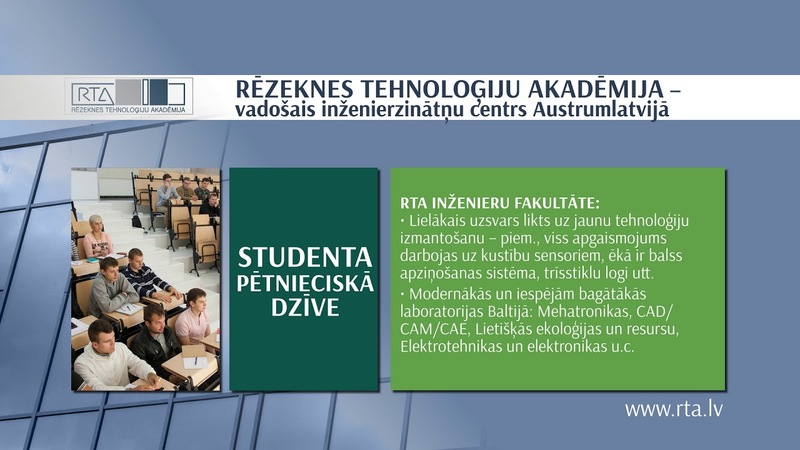 If you are interested in the studies at Rezekne University of Applied Sciences fill application form at this address: http://www.rta.lv/online_application_procedure.